The coffee chain is trying out a variety of new espresso drinks this winter. What flavor comes to mind when you think about the holidays? During the fall, pumpkin spice-flavored everything obviously reigns supreme. But during the winter, peppermint (the flavor of candy canes) is often king. But don't go looking for that refreshing minty boost if you're headed to a Dunkin' Donuts. Get more of our favorite recipes and more with TODAY's newsletters! Sign up here. Much to the dismay of legions of Dunkin' Donuts fans, the peppermint mocha coffee won't be an option in the chain's holiday lineup this year. A spokesperson from the coffee and doughnut brand, which recently announced a big name change (it will simply be "Dunkin' in January), told TODAY Food by email, "Our goal was to disrupt the norm with a bit of the unexpected from Dunkin’." However, the representative noted that the flavor could definitely make a return in future seasons. The spokesperson also hinted, "We’ve got something up our sleeve in early 2019 that will keep our mint fans smiling throughout the winter months." Despite the promise of more mint in the future, many fans are not happy with the chain's decision not to revive the classic holiday combination of peppermint, chocolate and coffee. At least one Dunkin' fan has even vowed to switch to a rival chain. While the Peppermint Mocha may be gone, there's a totally new flavor on the menu this year: Cinnamon Sticky Bun, which comes as a regular coffee flavoring, as well in latte form. Dunkin' is also introducing a few new holiday food items like the Hershey Kisses Donut with mini Hershey Kisses on a vanilla frosted doughnut and the uber-cute Dear Santa Donut that looks like Santa's suit with red frosting and chocolate icing, all topped with a powdered Munchkins doughnut hole. Other items for the holidays include a Holiday Spice Bacon Breakfast Sandwich with a double portion of sweetly spiced bacon (think candied bacon with flavors like brown sugar, cinnamon and nutmeg), as well as a new cinnamon-flavored cream cheese. Dunkin' also recently introduced some distinctly Starbucks-sounding type drinks as part of what it's dubbed the "Espresso Experience," which is a line of espresso drinks made from new state-of-the-art equipment. Now Dunkin' fans can order hand-made lattes, cappuccinos, Americanos, macchiatos and more. 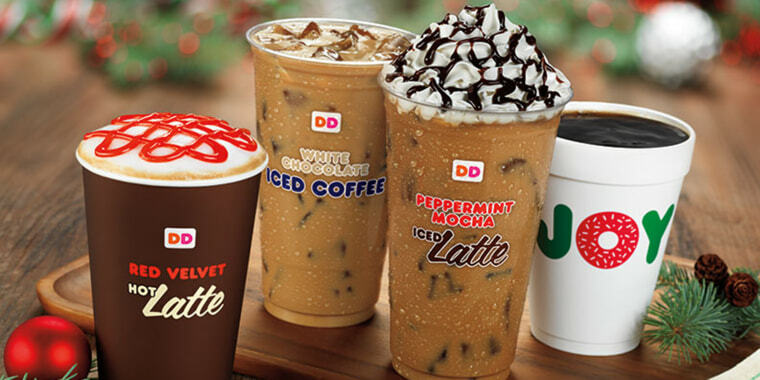 Options include a Caramel Flavored Iced Latte, White Chocolate Flavored Iced Latte a Hot Mocha Latte among others. So is really too much to ask to simply throw a Peppermint Mocha coffee back into the bunch?